Under favourable external conditions, the economies of the New EU Member States (NMS) fared even better in the first quarter of 2006 than in 2005. Investment accelerated sharply and industry is proving buoyant. Labour productivity has registered strong gains, unit labour costs declined. This is one of the reasons for the highly successful expansion of foreign trade, the second being the ongoing upgrading of exports and production. Foreign trade contributed positively to overall growth in Central European NMS already in 2005. In 2006, the growth contributions of both consumption and investment are also rising, thus making room for a more balanced overall GDP growth. Industrial production will continue to expand rapidly in 2007, also on account of robust domestic consumption and investment growth. With the exception of Hungary, fiscal policy will not interfere substantially with real growth. Trade expansion is likely to be supported by the continuing gains in unit labour costs. Weaker growth in the EU-15 will not restrict NMS exports too much also in view of ongoing structural changes and quality improvements in both NMS production and exports. The generally positive outlook for the next two years assumes an absence of major turbulence on the exchange rate markets. This assumption is not risk-free - especially where Hungary is concerned. It is to be hoped that the recently announced fiscal consolidation programme proves credible and pre-empts excessive adjustments. The labour market situation is improving across most NMS and accession countries as accelerated GDP growth has at last started to generate more substantial job creation. Migration to the UK and Ireland after accession was also significant, both in magnitude and in its effects on the sending countries, in the cases of Poland, Slovakia, Lithuania and Latvia. The effects on the UK and Ireland of migration from these countries have so far been modest but broadly positive. We expect similar outcomes for the next enlargement that will bring in Romania and Bulgaria. 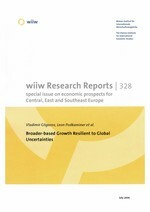 Growth, driven primarily by domestic demand, is expected to continue to be strong throughout Southeast Europe. The external balances should deteriorate due to strong demand for imports, which is sustained by exchange rates that are appreciating in real terms. Macroeconomic stability will be maintained, though inflation is picking up; and is a serious problem in Serbia and Romania. Inflation is a major concern in Turkey, as is macroeconomic stability more fundamentally. At the end of 2006 it should be decided whether Bulgaria and Romania will join the EU on 1 January 2007, as is widely expected; whether the EU will start negotiations with Macedonia, which at the moment seems unlikely; whether the other Western Balkan countries will sign Stabilization and Association Agreements with the EU; and what is the EU¿s strategy for further enlargement. The momentum has been lost when it comes to the Balkans, but the accession of Bulgaria and Romania and later on of Croatia may still make it possible for the rest of the Balkans to join the EU by 2015. Russian GDP growth is slowing down as the real sector weakens. Domestic demand is strong, yet the contribution of net exports to GDP growth is negative. Nominal exports are booming thanks to the high prices of energy and metals. Paris Club debt repayments are ahead of schedule. GDP growth will be about 6% in both 2006 and 2007; disinflation will be only gradual. The restructuring and institutional reforms are running late. WTO accession may be postponed yet again; it is unclear what course future EU Russia relations will take. In Ukraine the slowdown in economic growth has been reversed in 2006; domestic demand has picked up. But exports are performing badly, and the current account is expected to switch to a deficit. The hike in gas prices in early 2006 did not have any sizeable impact on the economy, not least because it has yet to be fully passed on to the final consumers. However, given the planned tariff hikes, inflation is expected to remain in double digits. The new government is likely to be less inclined to implement liberal reforms and its stability is questionable. The Chinese economy has kept fast growth in the first quarter of 2006. The expansion was mainly driven by a surge of investment and supported by a record foreign trade surplus. Private consumption developed at a stable pace, inflation remained low. Government measures to dampen growth and to prevent an overheating of the economy may become more effective in the near future. Nevertheless, we expect GDP growth close to 10% in both 2006 and 2007.